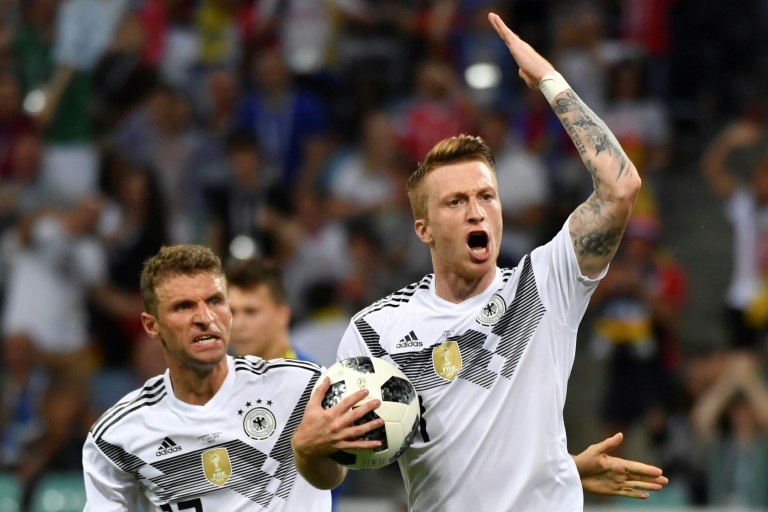 Marco Reus says Germany must ignore the pressure and play their brand of free-flowing football to win the make-or-break World Cup game against South Korea on Wednesday and reach the last 16 in Russia. Joachim Loew's team need to win by a two-goal margin in Kazan to be sure of advancing to the knockout rounds after recovering from a shock defeat to Mexico with a last-gasp 2-1 win against Sweden. South Korea are bottom of Group F after losing their opening two games. "South Korea have very fast, agile and versatile players who create a lot of problems for many teams," said Reus, who expects the Asian team to copy Mexico's tactics of counter-attacking through Germany's midfield. "We assume that they will also bet on counter-attacking and want to be defensive, tight and secure. "However, I am quite convinced that if we play in a liberated way and with the same fluent style, quality and passion that we invested against Sweden, South Korea will have a hard time beating us." After Sweden took the lead in Sochi on Saturday, Reus sparked Germany's fightback with a second-half equaliser before Toni Kroos hit the winner. Borussia Dortmund winger Reus, 29, and RB Leipzig forward Timo Werner are among the few players in the under-performing German squad to have shone so far in Russia. Werner, 22, admitted the Germans have seen little of South Korea, other than their defeats to group rivals Mexico and Sweden, but will do their homework. The Germans know all about Tottenham Hotspur striker Son Heung-min, who used to play for Bayer Leverkusen in the Bundesliga. "They have very fast and alert forwards, they are probably the opposite of Sweden, who have a strong and physical presence, whereas South Korea play with small, speedy and alert players," said Werner. "In Son Heung-min, they have an internationally well-known player. He has shown what he can do, so I think we really need to keep an eye on him. "Having said that, we shouldn't watch the opposition too closely - we need to focus on ourselves."